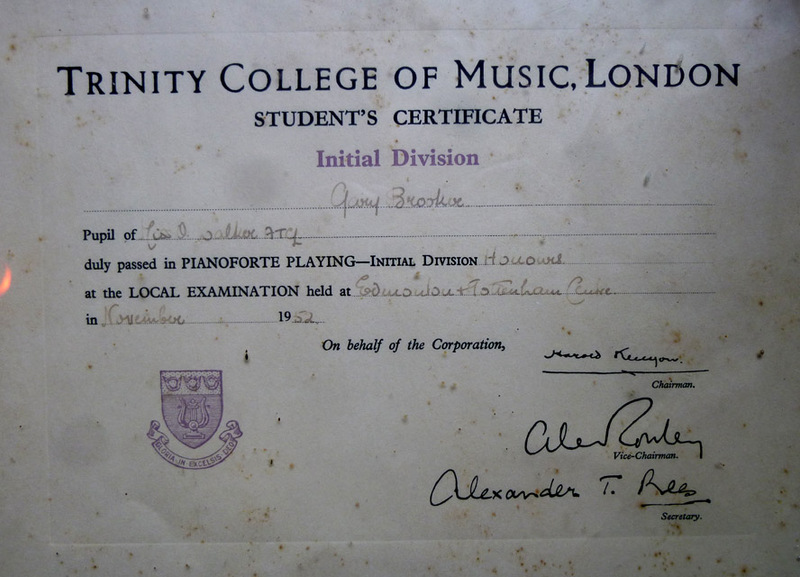 Amazingly enough, the formal music qualifications of Gary Brooker – the composer of Whaling Stories among other extraordinary songs, the orchestrator of A Salty Dog among many other spectacular arrangements, and the player of the piano on almost all Procol Harum's brilliant catalogue – are represented in these two humble snapshots of his exam certificates which, somewhat foxed under glass, are propped on a ledge in the rehearsal-studio in the barn adjoining his home. 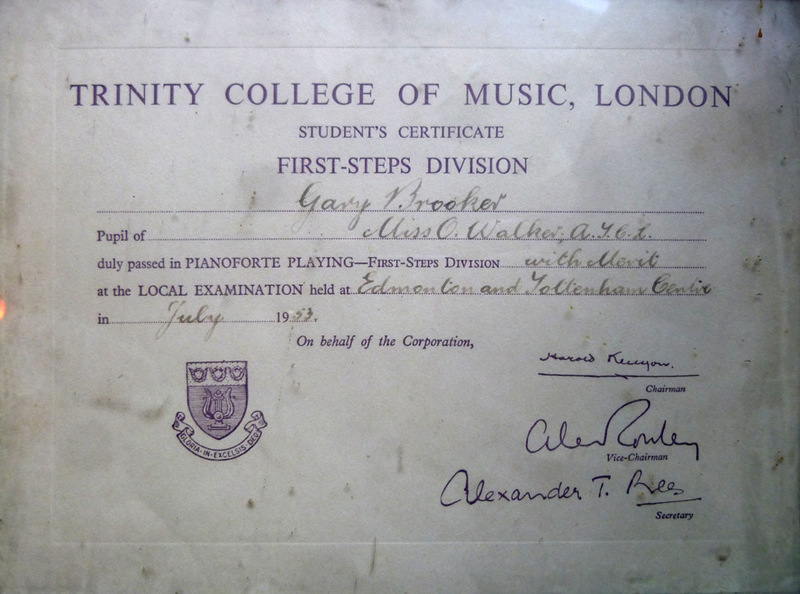 Gary was taught the piano by Miss O Walker, who prepared him for the examinations. 'Trinity College of Music, London' is the authority running the exams, and issuing the certificates. There's no implication that GB attended a music college. This Board was favoured by piano-teachers in many parts of the world: read its history here. For this exam, which he passed in November 1952, at the age of seven, GB would have had to play some elementary pieces (using both hands), a couple of scales, and probably tackled a little sight-reading. Ear-tests in addition were an easy way for a musically-gifted child to gain marks. In this instance, Gary was awarded 'Honours': the highest category of achievement. 'First-Steps' Division. By July 1953, however, the eight-year-old did not reach the heights of 'Honours', and was graded at 'Merit' level, the second stage from the top. Miss Walker herself held the qualification ATCL – Associate of Trinity College London – which was the humblest of three Diplomas offered by the Board. tutelage of Ronald Meachen – whose song-based, chord-friendly methods differed markedly from those of Miss Walker – that his piano-playing took off again. the death of Gary's musician father Harry Brooker) subsidised and encouraged the young player's performing ambitions.